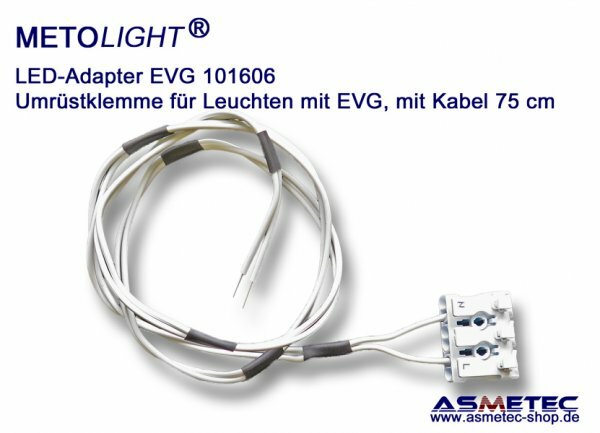 For rewiring luminaires with built in electronic ballasts (for CFL-Tubes to change to LED-tubes) you must rewire the G13 / G5 sockets and unmount the existing ballast in case you want to use METOLIGHT LED-Tubes with SCE / VDE singe input safety connetion. This adapter clamp makes it quick and easy. Simply pull out the 4 wires at the exit of the electronic ballast and insert in same order into the adapter-clamp. The opposie side of our clamp ir equipoped with 70 cm long duo-hard wires which muzst be connected to the L + N - Terminal in ther lumionaire. such works maxy only be executed by experts. The luminaire mains power must be switched off before installing.